The Boston Camerata, an ensemble specializing in music from the baroque era and earlier, was founded in 1954. It was originally a performing adjunct to the musical instrument collection at the Museum of Fine Arts in Boston. Between 1969 and 2008, the group was directed by Joel Cohen, under whose leadership the group produced a number of recordings, including many albums of rather unconventional Christmas music. The first one that I obtained in 1975 (on vinyl) was called A Medieval Christmas. That album was followed over the years by six more recordings, each focusing on music from a specific era or region. Among these works are some from the Sacred Harp tradition, such as this piece called “Baptismal Anthem,” which is the story of the coming of John the Baptist. And here is the rousing performance of “Boston” by the Boston Camerata, supplemented by the Schola Cantorum of Boston. In an earlier post, I explained why there were so many tunes to which people sang “While shepherds watched.” One of those tunes was SHERBURNE, written in 1793 by Connecticut musician Daniel Read. It is apparently still a favorite at shapenote sings. While CDs of this recording are hard to come by, it is available from a number of digital music sources. 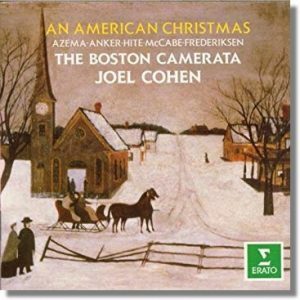 The earlier album I mentioned, A Medieval Christmas, has been repackaged along with two other Boston Camerata releases, A Renaissance Christmas and A Baroque Christmas. This latter collection includes the complete Christmas Eve midnight mass of Marc-Antoine Charpentier (Messe de minuit pour Noël), one of the gems of the French baroque Christmas repertoire.